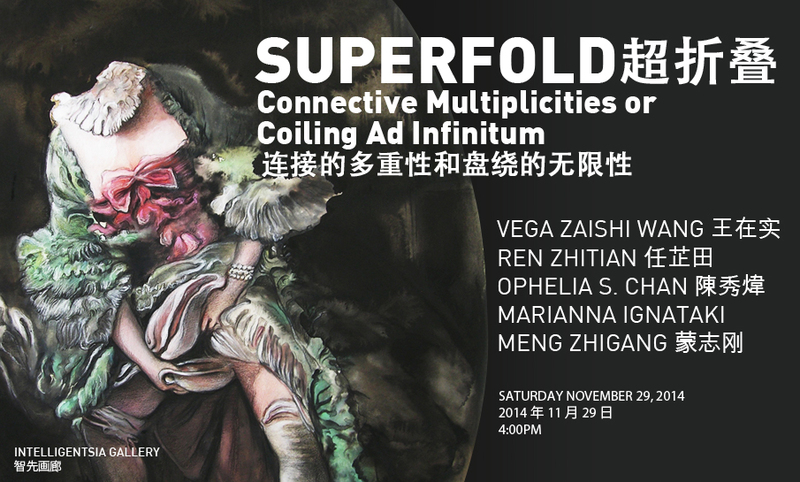 Intelligentsia Gallery is delighted to present Superfold: Connective Multiplicities or Coiling Ad Infinitum, a group exhibition with works by Meng Zhigang (b. 1975 Guilin, China), Ren Zhitian (b.1968 Xishui, China), Ophelia S. Chan(b. 1985 Hong Kong, China), Vega Zaishi Wang (b. 1985 Liaoning, China), and Marianna Ignataki (b. 1977 Thessaloniki, Greece). Based on its operative function and characteristics, the fold with its twists and turns, coils and bends has the capacity to connect on a single surface diversified multiplicities. Either metaphysical or material, in the form of a textile labyrinth or as the endless virtual projection of images, the fold can outline topographical maps of rhizomatic relations as connective tissue of history and visual information. The artwork and the work of art act as codifiers and decoders of processes that are then revealed as territorial connections of multiplicities and episodes, as extensions of surfaces and meaning. Curated by Garcia Frankowski under a structural framework built by Gilles Deleuze, Superfold explores surface extension in all directions: the folding cloth over the furniture, the bottom layer of naked skin potentially covered by opaque sensuous clothes that reveal by disguising, the washed out covers of glamour images diluted into new forms of visual paraphernalia, images projecting from space into a cache of collective assemblages of enunciation, hanging material folds of the stored sublime path of performative history. By means of painting, collage, mix-media, fashion and video installations the exhibition aims to create a flexible, elastic body, able to bring all the multiplicities ( historical, theoretical, functional, aesthetic, philological) into a cohesive surface unveiling the connective continuality of the artwork as Superfold and its capacity to coil ad infinitum.